Learn how to respond to first aid, breathing & cardiac emergencies. An American Red Cross Instructor will guide you through hands-on practice of lifesaving skills on how to care for breathing and cardiac emergencies in adults, children, and infants. Prerequisites: must be 12 years old. 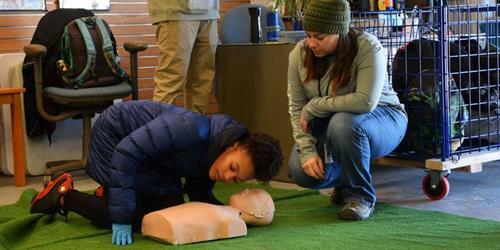 Participants will be certified in American Red Cross CPR, First Aid, AED for the professional rescuer. Online registration will close 48 hours in advance of this class. All classes must have a minimum of two participants to run, so we encourage you to bring your friends!